This beautiful Ivory Unity Candle with Two Ribbons would make a perfect prenuptial gift or Christmas gift for your favorite couple this holiday season. 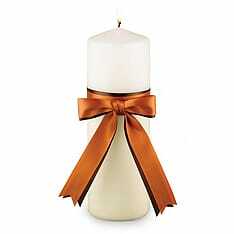 The Mix n Match pillar candle offers two ribbon colors of your choice. Each ribbon is tied daintily around the center of this 9 in. X 3 in. dripless candle to create an elegant addition to your unity lighting ceremony. Ribbons are offered in 27 vibrant color choices to ensure your satisfaction. When ordering, please keep in mind that the ribbon color you specify as “Ribbon #1” will be the color of ribbon that is placed on top. This unity candle offers a splendid peacefulness and serenity to your unity lighting ceremony. Complete your ceremony with one of the many accessories in the Mix n Match ivory wedding accessories collection. This exclusive Ivory Unity Candle with Two Ribbons can also be a perfect complement for your wedding reception, and a timeless gift for wedding anniversaries, bridal showers, and so much more.